This is Emesis the turkey vulture. I always call her a beauty queen and here she is doing her “over the shoulder” pose. She came in as a juvenile vulture with a broken wing that had begun to heal on its own but it had formed a huge callus, larger than a golf ball. The callus weighed her wing down and it was apparent that she would never be able to fly again. We tried to save the wing, but she just stepped on it and had trouble getting around with it dragging on the ground. A unanimous decision was made by the medical staff that amputating the wing would make her life easier. 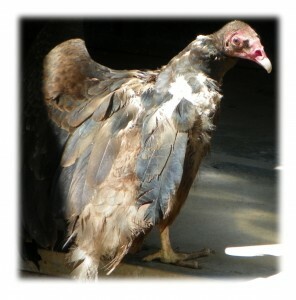 She healed nicely and was soon moved outside to live with our other turkey vulture and the bald eagles. She loved being in with the eagles and thought she was so cool to have 2 bald eagle best friends. Then the bald eagles laid an egg during a severe snow storm and they got aggressive with the other birds in the enclosure trying to protect the egg. Imagine Emesis surprise when she was kicked out of the shelter during the storm in the middle of the night. Emesis is now happy in an enclosure of her own. She is actually the prettiest turkey vulture I have ever seen.